FILE - Participants march against sexual harassment and assault at the #MeToo March in the Hollywood section of Los Angeles, California, Nov. 12, 2017. FILE - Harvey Weinstein arrives at the Oscars in Los Angeles, California, March 2, 2014. "I couldn't have been in bed more than eight hours, because I'm a mom," Milano says now. When she awoke, tens of thousands had taken up the #MeToo hashtag (a phrase introduced 10 years ago by social activist Tarana Burke). Less than 10 days later, Milano tweeted that more than 1.7 million people in 85 countries had used the hashtag. FILE - Alyssa Milano arrives at the 69th Primetime Emmy Awards Entertainment Weekly pre party at the Sunset Tower Hotel, Sept. 15, 2017, in Los Angeles. Even before #MeToo happened, and just a few days after the Weinstein story broke, Anita Hill was sure something significant was happening. "I think we need something to push the needle and I think this has done it," says Hill, a symbol of the fight against sexual harassment ever since her 1991 Senate testimony against then-Supreme Court nominee Clarence Thomas. Still, she notes, it was a lot easier for Hollywood stars like Gwyneth Paltrow and Angelina Jolie to speak out than it was for ordinary women experiencing harassment from their bosses. 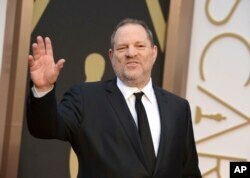 As the weeks went on, the accusers multiplied, and so did the accused, from Hollywood (Kevin Spacey, Louis C.K., Brett Ratner, Dustin Hoffman) to the news business (top morning hosts Charlie Rose and Matt Lauer) to the music world (Russell Simmons) to politics (Sen. Al Franken, Alabama candidate Roy Moore) to the food world (Mario Batali). 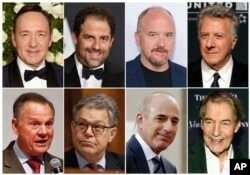 This combination photo shows, top row from left, Kevin Spacey, Brett Ratner, Louis C.K., Dustin Hoffman, and bottom row from left, former Alabama Senate candidate Roy Moore, Sen. Al Franken, D-Minn., former "Today" morning co-host Matt Lauer and former "CBS This Morning" co-host Charlie Rose, all of whom have been accused of sexual misconduct. The accused lost jobs, TV shows, book deals, a Senate seat — with dizzying speed (Spacey was even erased from a completed movie). Some simply apologized, while others fought back — like Simmons, with his hashtag #NotMe. Some apologies were more effective than others. Spacey drew flak for deciding to come out as gay as he apologized for unwanted sexual advances; Batali was scorned for appending to his email-blast apology a recipe for Pizza Dough Cinnamon Rolls.